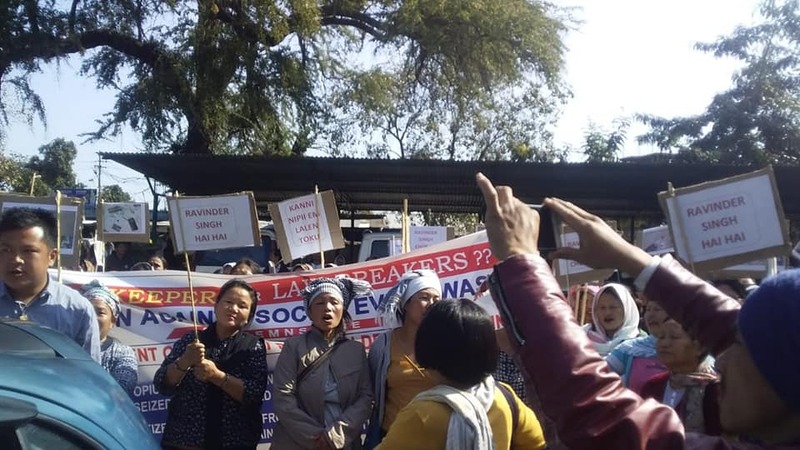 Women against Social Evils (WASE) of Pasighat in Arunachal Pradesh, an activist group working for eradication of hooch, gambling and drugs abuse conducted rally against alleged police involvement in drugs trafficking in Pasighat area on Saturday. The women have raised serious alliteration that large quantity of opium seized from the illegal traders had gone missing from police custody. About 200 WASE members led by its secretary Joya Tasung staged dharna in front of Pasighat sadar police station in East Siang district and shouted slogans against police inaction against the illicit drugs traders. As per allegation, the case was dealt by an sub inspector of Pasighat police station, who kept the seized opium in custody for production before the court. But, the drug has gone missing the the next day. The report of missing of seized opium from police custody is causing serious concern among the WASE members and the local people as well. Reacting to the missing of drugs from Pasighat PS, local MLA Kaling Moyong has directed East Siang deputy commissioner and superintendent of police for institution of magisterial inquiry into the incident. “I have asked the DC and SP of East Siang to institute magisterial probe and unearth the facts behind missing of seized drugs from the police custody”, MLA Moyong said. Former education minister of Arunachal Pradesh, who is a native of Pasighat town has demanded the higher ups of the police department to conduct proper investigation of the case besides taking steps to prevent re-occurrence of such incident in the police department. According to East Siang SP Prashant Gautam, he is looking into the matter deeply and will take disciplinary action against erring officer found involved.